I read an interesting article about the nourishing and healing effects of silence today. There are now scientific studies that show the effects noise has on the body over time. Increases in the release of stress hormones, high blood pressure, and tinnitus. The studies also show how silence can reduce our stress hormones and even out our blood pressure. The most interesting part was discovered by accident when studying the effects of music on our bodies. The two-minute silences between musical pieces were significantly more effective at reducing stress symptoms than the longer stretches of silence before the music began and the relaxing musical pieces designed to reduce stress. What was important was the contrast between noise and silence, not the length of the silence. This is good news for busy people. Many of us have a busy and family-filled couple of days ahead of us. For others, our jobs or family obligations have brought us extreme volumes of noise. If you are finding yourself in need of a noise break, invite some silence into your life. Go for a walk at night through the neighborhood, shut off the television an hour before bed, put down your phone or tablet, and read a book, write in a journal, or just stare up at the night sky. 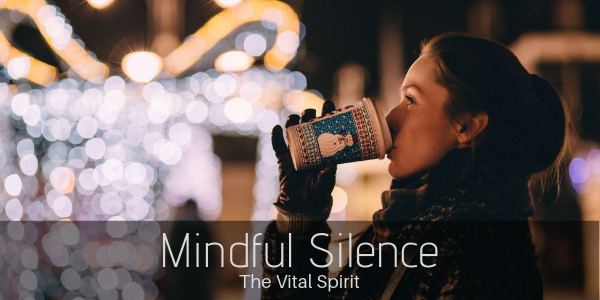 Silence allows us to reconnect with our Spirit, our intuition, our creative spark. If you have been feeling drained or depressed let silence realign you with you. Bringing a sense of peace and confidence for the journey ahead into 2019. Wishing you a little peace and silence each day this week.